Back to previous post: Religion is always confusing when you’re a kid. It’s that time of year when fresh ripe tomatoes used to be really cheap. Maybe they still are somewhere, but not in my neighborhood. We get greenhouse “vine tomatoes” all year round, and they’re $2.49 a pound in July just like they are in January. 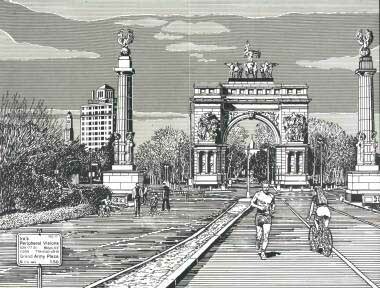 Maybe I’ll go up to the farmer’s market in Grand Army Plaza tomorrow morning and see what’s available. This is a recipe for tomato junkies. Also for people who get shanghaied by irresistible tomatoes and fresh basil at farmer’s markets, but are too tired when they get home to do anything elaborate with them. Martha Stewart would use it as a salad or appetizer, but we eat it as our main course and are happy therewith. Required ingredients: A lot of good tomatoes. Salt and pepper. Just a dollop of Best Foods (Hellman’s) mayonnaise—you don’t want to drown it. An unsliced loaf of good French or Italian bread. Don’t use that mooshy sandwich stuff. Potentially advantageous additions: A little chopped fresh basil. A little chopped green onion. (Go light. This dish is about tomatoes and bread.) If you insist, you can probably get away with olive oil instead of mayonnaise, but it’ll be a different dish. And if you’re so fortunate as to have salad burnet (Sanguisorba minor) available to you, by all means put it in. Season with salt and pepper to taste. If you’re adding a little fresh basil or chopped green onion or salad burnet, add it now. Set the tomato mixture aside to bleed. Take a serving bowl (glass, if you want to show off how pretty this is), and arrange about half the bread chunks in a layer on the bottom. Spoon some—not half, just some—of the tomato mixture over them. With any luck, there’ll be a lot of tomato juice tinged with mayonnaise lurking in the bottom of the bowl. Make sure some of that gets onto the bread. Now take the rest of the bread chunks and layer them in, then spoon all the remaining tomato mixture over them. Press it down a little with the back of your big wooden spoon, or wash your hands well and press it down that way. Don’t squash it. You’re just trying to get the bread to soak up tomato juice. Serve fairly soon. I know this dish sounds a little weird. Ask Patrick how it tastes. Went to the grocery store and indeed there were many tomatos on hand at $.99 per lb. Bought bunches and made your recipe... Dear God, that's tasty! Hmm. To me, it seems too much work. I'll just use the exact same ingredients to make my fave summer treat. Tomato Sandwiches. Mmmmmm. Basil good on that, too. Mmmmm. It doesn't sound weird to me: it sounds marvelous. I'm a big fan of tomato sandwiches, too, and it sounds like a great way of getting the soggy-bread effect (a big plus in my book) without having the sandwich drip all over your hands, face, and shirtfront (or bodice if you're wearing 19C clothes--and why are you eating a tomato sandwich in your fancy garb? For shame). As someone who can be relied upon to wear his food, I testify to the truth of Christopher Hatton's observation. Any way you combine them, tomatoes, mayonnaise, and fresh bread are an Alchymical Marriage. Yum. Right all round. I love tomato sandwiches, but I also like my white bread chewy. The force it takes to bite through two layers of it exceeds the force it takes to squeeze mayonnaise-laden tomato slices out the other end of the sandwich. And while it's true that you can avoid wearing your sandwich by wrapping the lower half of it in a paper towel and adjusting the wrappings as you eat, ending up with a sodden pink paper towel and a clean shirt, I'd just as soon have the tomato juice sopped up by the bread. And may I add: Erik, this is less work, not more. Well, I don't know. I'm very unfond of mayonnaise though I use it in making things like chicken or tuna or egg salad. I might try it with the olive oil. And basil and shallots. Of course, first I have to find a place in Seattle to get both good tomatoes and good bread. It was pretty pitiful yesterday when I was standing in the bread aisle of Safeway whimpering, "No sourdough," over and over. I'm not sure I can live without sourdough baguettes. And then of course, there's simply slicing the tomatoes and sprinkling them with salt and eating until they're all gone. You can still use slices of good bread to sop up the juice. God, I love tomatoes. Mary Kay, what you need is a recipe for panzanella, a Tuscan bread-and-tomato-and-basil salad with olive oil and vinegar. I think it also includes cucumbers or celery -- something green and crunchy, anyway. Panzanella is good. And tomato sandwiches always make me think of Harriet M. Welsh. Oh, sure. Make me drool. It's the middle of winter here, and not a fresh tomato in sight. I'll just have to copy your recipe and save it till November or so. Meanwhile: brrrr! Now, whose idea was it to move to New Zealand? You mean the weather's cool where you are? Oh, man. Swap you for some tomatoes. Cold and rainy. Ick. We moved from Indiana to New Zealand in May, so I'm getting two winters in a row, which I consider to be totally Not Fair. Cold and rainy doesn't sound bad at the moment. Our bedroom AC died weekend before last, and they've had to order a replacement part for it. I promise to freeload shamelessly on you guys if I ever get to New Zealand. My picture of the place is entirely drawn from tourist board ads, watching The Fellowship of the Ring, and reading a complete run of Footrot Flats. I have to admit, for midwinter, cold and rainy is a whole lot better than frigid and snowy. Now I just have to explain the concept of central heating to them here....Climate control is not a strength here. Meanwhile: I hate to impose, but a lot of our mail has gone astray recently. In April/May-ish, L-J sent you one of those please-return-this-postcard thingies to check and see if you'd received her two mss, and the postcard never made its way back to us. Will it drive your office staff mad if we send another one? Speaking from experience as a greenhouse labourer in the Tomato Capital of Canada (Leamington, Ontario), I would urge you to visit the farmers' market, and buy from the first purveyor of organically-grown tomatoes you can find. If you _must_ have your greenhouse-grown tomatoes in winter, then do, but take advantage of the summer harvest to get the proper love apples. I KNOW what goes into those things they sell as "vine tomatoes", and I know about how they grow under a cellophane sky, rooted in "rock-wool" plastic tubes, fed water and chemicals at appointed times, and pollinized by bored bees who spend their entire insectoid lives among the tomatoes, and never know what it is to pollinate a rose or a daisy, an apple blossom or a skunk-cabbage (o.k., neither do I, but I'm not a bee). Oh, yeah, and when it says "no chemical pesticides used", your vegetable grower is telling a bold-faced lie. Wash those fruits with soap! Organo-phosphates, dipel, pyramite, and whatever-that-icky-stuff-they-sprayed-to-kill-the-whiteflies-was should probably not be ingested in any trace quantities. I don't harbour any illusions about other veggies, but tomatoes are my sole first-hand agri-business experience, and under the burning greenhouse sun, that was sufficiently chilling. Our balcony-grown heritage varieties are just starting to ripen (it was a late planting), and I am feeling quite positive about these.